Hydraulic cartridge valves are used for making compact, robust, low-cost custom circuit design. They can provide more compact circuits than with CETOP valves and with fewer external leak point or components to get damaged. Applications may be mobile equipment or large volume industrial machines of all kinds. Cartridge valves may be used with other cartridges in a custom manifold or individually within a sandwich slice, in a CETOP valve stack. Cartridge valves generally provide the same functions and standard industrial valves except that they are supplied as a screw in cartridge that gets inserted into a custom manifold. It's the responsibility of the manifold designer to make sure all of the ports correct correctly, as laid out in the circuit. Each cartridge may contain the same or similar valve spools or poppets as an industrial manifold mounted valve. However, the valve body is formed from the screw in body plug, rather than a cast body or solid machined block. Cartridge valves are available with 2 ports, 3, 4 or even 5 ports within one cartridge. The convention is to name the ports from 1 at the nose of the cartridge, however, this is not always standard, even within one manufactures. There is now an agreed standard for the cartridge cavity design but because different manufacturers have been making their own cavities for many years, it is unlikely we will see a single cavity design within the industry for many years. 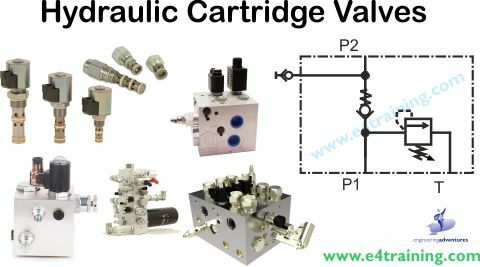 It's probably true to say that there are more variations in valve control type produced in cartridge valve format that in manifold mounted. With the exception of high-performance servo and proportional valves, you can probably find cartridge versions or most valves you can think of and all that you need. Good contamination control is always the most important factor with hydraulic equipment maintenance and with cartridge valves, it's still the same. Always keep new valves in sealed bags until they are fitted. If the manifolds are new then carefully check every cavity for dirt and preferably re-wash them in an appropriate cleaning solutions. All manifolds should have been washed after manufacture but when mass producing manifolds it's always difficult for the manufacturers to keep their cleaning tanks clean, so they may not be perfect when delivered. A potential source for dirt ingress is from the thread of the cartridge body. This screws directly into the manifold and is often under the final valve seal i.e. within the circulating fluid cavity. Not only is this a potential risk area but thread is a potential dirt source as small particles of metal can break away as the threads tighten against each other. When removing cartridges, examine the external seals for wear. These seals should hardly move at all so if you see signs of wear then it may be as a result of hydraulic instability or setup issue that's caused the seals to oscillate. If you remove a cartridge because it's faulty then it's generally advisable to simply install a new cartridge of the same type. However, it's probably worth stripping the old cartridges to look for signs of damage, as this may warn of other faults or causes. If there score or rubbing marks on the sides of the spool, and you know your fluid is clean, then this may indicate an issue with the straightness or eccentricity of the manifold's bore. Because of the very fine clearances required to make spool valves work, any manufacturing errors in the cartridge cavity can lead to distortions in this cartridge body that affect the quality of this clearance. Some cartridge manufacturers build in flexibility between their fastening threads and the spool retaining body, this provides extra reliability as it's impossible to machine and measure thread concentricity with a high degree of confidence. Although cartridge valves may look like a perfect solution for production machines they generally don't provide the reliability and performance of good CETOP valves. This is because their cartridges are prone to eccentricities which can create side loads on the spool bores. The threads add the potential for dirt and the smaller restrictions and sharp fluid direction changes can make them susceptible to higher flow forces and therefore less precise characteristics. The seals around the body are another area of risk along with the complex manifold design. 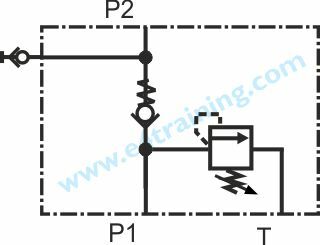 They are also less flexible when developing designs which have a habit of changing and making the manifold out of date and unusable, whereas sandwich plate circuits can generally be changed quite easily. If you do commission a new manifold design make sure it is produced by a company that makes lots of them. The cartridge cavities must be manufactured with special tools that are supplied by the valve manufacturer and regularly inspected for wear by the manifold manufacturer. Do not attempt to machine the cavities with standard boring tools. © Copyright Engineering Adventures , all rights reserved. Last Updated 2018-12-18.